Loop 2.4.3 is a community of creative artists, and individuals who believe in this art, and the role it can play within our culture. 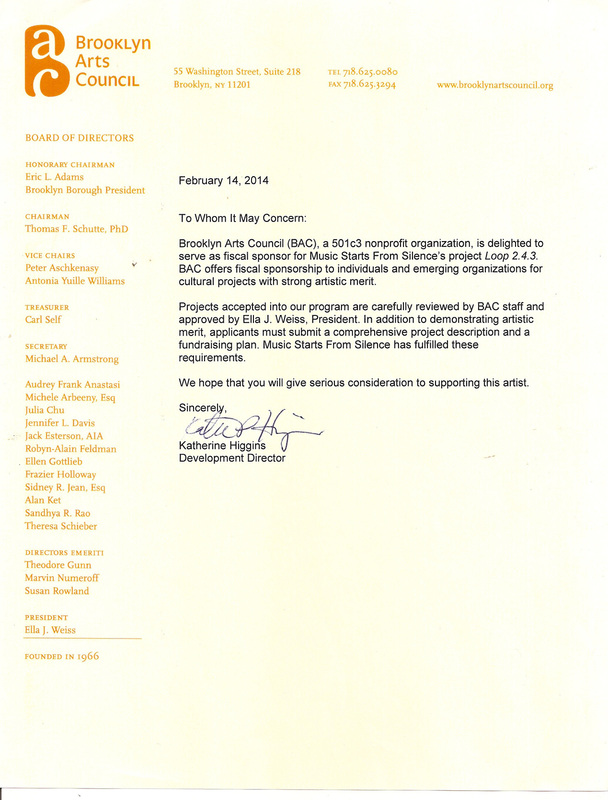 Our projects are chiefly supported by private donors, through our non-profit fiscal sponsor, the Brooklyn Arts Council. CONCERT-LOOP Help produce a Loop 2.4.3 visit to your area. As many of you know, classical, jazz, and experimental music events are generally not funded on ticket sales alone. They need underwriting to cover the variety of production expenses. You can help fund a Loop 2.4.3 visit in your area by donating lodging, a venue, administrative support, and/or funds to cover travel, etc. Your name will be listed in the program as an underwriter/producer of the event. OUTREACH-LOOP Help underwrite a Loop 2.4.3 appearance at a public school, library, senior center or other under-served community. LEGACY-LOOP Help cover reproduction and distribution set-up costs for a legendary set of recordings. These recordings are the last studio sessions produced by Robert Hohner for his percussion ensemble. Recently re-mastered by Jeff Harrison, the album was originally recorded by Harrison in 1998, and was eventually set aside due to illness. The album includes Mr. Hohner’s definitive version of Ionisation. Proceeds from this project go toward other Hohner Ensemble recordings. Designate the project in your donation (see above). Purchae the album at the MSFS Records store. Host/Present: Want to share Loop 2.4.3 with your community? Contact us to discuss a performance, talk, and/or workshop. Become a Member: Being a member allows you to access exclusive music streaming, free downloads, and more! Content will be updated periodically, so check back for more. See the upper right corner of this page to sign up. Help us keep the music rolling! 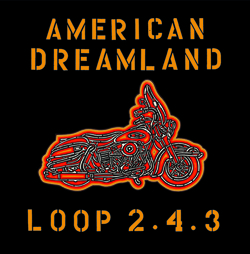 Loop 2.4.3 has released 4 recordings through Music Starts From Silence: Batterie (2007), Zodiac Dust (2009), American Dreamland (2012), and Time-Machine_music (2015). These albums feature all original works, many of which are available as scores/parts for others to study/perform. You'll also find T-shirts sporting creative designs by Stephen Gilewski and Jon Waldo. Visit the Music Starts From Silence store for details. Special Thanks to THIS YEAR'S LOOP SPONSORS! Dr. Jill Ball, Rebecca Becker, Dr. Graeme Francis, Erika Freds, Kevin Getchell, Dr. Scott R. Harding, Eien Hunter-Ishikawa, Jon D. Johnson, Seth Kilbourn, Kevin Kosch, Thomas Kozumplik, Stephen A. Martin, Lorne Watson, Jeff White, Tobie Wilkinson, David Zerbe, Tony Zilincik. Sean Boyd and ArtFarm Recording, Carroll Music, Stephen Gilewski Design, Dan Gottesman Photography, Joel Hamburger and GodelString, Jon Lundstrum (Junebug Photography), New York Percussion Service, David Yearwood Yoga, David Zerbe and the Legacy Percussion Orchestra, the Hohner Institute of Percussion and HIP worldwide. Thanks to the following artists for their collaborative efforts: James Armstrong, John Amira, Allan Baker, Noelle Barbera, An-Lin Bardin, Scott Bearden, Istvan B'Racz, Tom Burnett, Jon Catler, Classical Revolution RVA, Clogs, James Godwin, Kiyoshi Inoue, Aviva Jaye, Todd Reynolds, Jon Waldo, and Shara Worden.